The Nelicourvi Weaver was formally named by Giovanni Antonio Scopoli, a Tyrolean naturalist, in 1786. 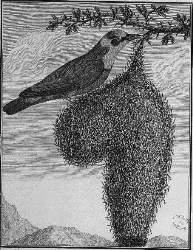 Scopoli gave a scientific name and description of the Nelicourvi Weaver in Latin, based on the publication of Pierre Sonnerat. Sonnerat made several voyages to southeast Asia, visiting the eastern coast of Madagascar in 1772. He visited Fort Dauphin near the south, but probably also visited other ports along the coast. He also observed the nests of the Nelicourvi Weaver, noting the long entrance tube and that several could be found in 1 site. Sonnerat published his travel diary in 1776. 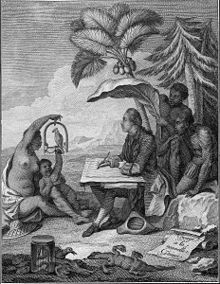 Sonnerat provided a French name (Le Nelicourvi de Madagascar, the finch of Madagascar) while Scopoli, who had been corresponding with Carl Linnaeus, provided a binomial name and thus is credited as author of the Nelicourvi Weaver. Parvus nelicourvi	Scopoli 1786	Del. Flor. Faun. Insurb., fasc. 2, p.96	Madagascar, ex Sonnerat, pl. 112.
parvus (Latin) = small, little. nelicourvi = doubtless from the Tamil (Sri Lanka) name nellukuruvi for a finch or waxbill, the Madagascan Nelicourvi Weaver thought to have come from Indomalaya. 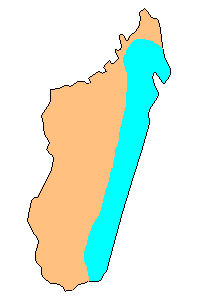 1770, when Sonnerat visited Madagascar. East coast of Madagascar, possibly Fort Dauphin. No type specimens known to survive, but the painting of Sonnerat serves as a type. Identification. The male Nelicourvi Weaver Ploceus nelicourvi has a black helmet, surrounded by a yellow band and grey underparts; the undertail-coverts are a conspicous rufous-chestnut (photo far left, from phown 179). The female resembles the male, but the black head is replaced with yellow, but with grey lores, and olive crown patch (photo right, from phown 920). The name is thought to be a Sri Lankan word (nellukurvi) for finch. Distribution. 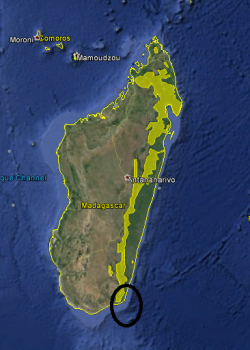 The Nelicourvi Weaver is endemic to forests of eastern Madagascar (see light blue on map below), based on Handbook of the Birds of the World, Vol. 15). There are no subspecies. Habitat. The Nelicourvi Weaver occurs in rainforest and secondary forest from sea level up to 1950 m, also at forest edges, in secondary habitats and village gardens near forest. Food. The Nelicourvi Weaver feeds on insects, like beetles, bugs (Hemiptera) and grasshoppers; also spiders and possibly fruits. They regularly join mixed-species flocks of insectivorous birds. Breeding. This species is monogamous, and probably has a long-term pair-bond. They are solitary breeders, with one nest, or sometimes two nests at a site but only one occupied. The nest (right, from phown 1028) has an entrance tunnel which varies in length, up to 20 cm long. The male suspends the nest above the ground, over a path or clearing, or suspended over a stream. The extent to which the sexes share incubation and feeding of the young is unknown.